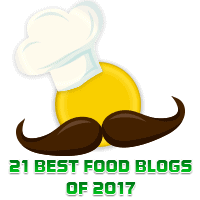 What is Australian cuisine? A few years ago, this question would have been unanswerable. Even now, it’s a head-scratcher. It is not uncommon for tourists visiting Australia to remark that despite our food being – you know – delicious, there is very little about it that’s Australian. In fact, we Australians like to overplay our multiculturalism – with the best of intentions of course – in saying that we have the best ‘X outside of X country.’ Oh, this is the best steak outside of France. The best Peking duck outside of China, the best coffee outside Italy. Of course, that our produce is often world-class in its own right is a large part of this. But we do not have the cultural depth and rich traditions of the old world, a bedrock from which we can forge our own culinary identity. Indeed, it is also common for a separate group of tourists to deride our food for exactly this: a lack of what can be called our own. But of course, we’ve always had it. And it goes back much, much further than you might think. For over 60,000 years, a time span that reduces Western Civilisation to a twinkle in one’s eye, the Aboriginal people of Australia thrived. They baked damper over open fires, gorged on witchetty grubs, cut their teeth on crocodile meat and seasoned it all using saltbush, kakadu plum and lemon ironbark. Their dessert? Desert figs, finger lime and Davidson’s Plums. Heard of any of these? To indigenous Australians, this was just how it always was. 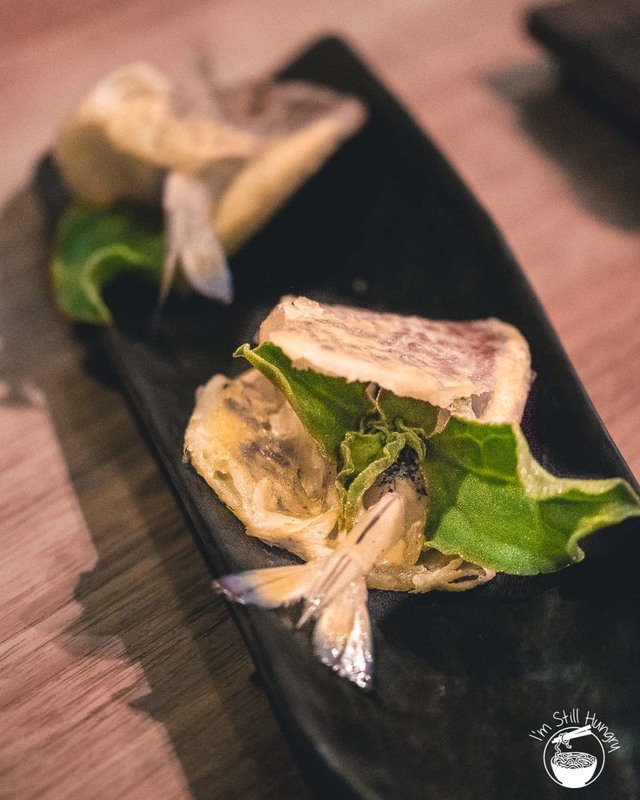 When Rene Redzepi visited Australia in 2010, he famously scolded Australian chefs – ‘I come here and I don’t know what Australia tastes like.’ This talk-down, along with the Noma Australia popup set up several years later majorly catalysed the movement towards something that could be called ‘Modern Australian cuisine’. Of course, we’ll never admit it. It’s funny that it takes outsiders to remind us what we have on the inside. Hell, take Attica: perhaps one of the only other restaurants to which I’d point my finger at when asked name a truly ‘Modern Australian’ restaurant. It’s run by a Kiwi – double the aforementioned irony. Enter Orana, and its Scottish head chef Jock Zonfrillo, and immediately triple that. Well, we’ve always been a country of outsiders, I guess. I feel I can say this without hyperbole: Zonfrillo, along with Orana is Australia’s Rene Redzepi. He’s not as famous, but the scales are relative: when people think modern Nordic cuisine, they think Rene Redzepi and Noma, with all his focus on foraging and intense localism approach to food. Well, that’s exactly the deal with Zonfrillo, and Orana. Australia is a country which in terms of habitation history and size is more bounteous than almost any other country. And yet despite this, most people wouldn’t have recognised even half of the ingredients I mentioned near the top. 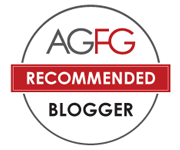 I certainly couldn’t – not before visiting Orana (and to a lesser extent, Attica). 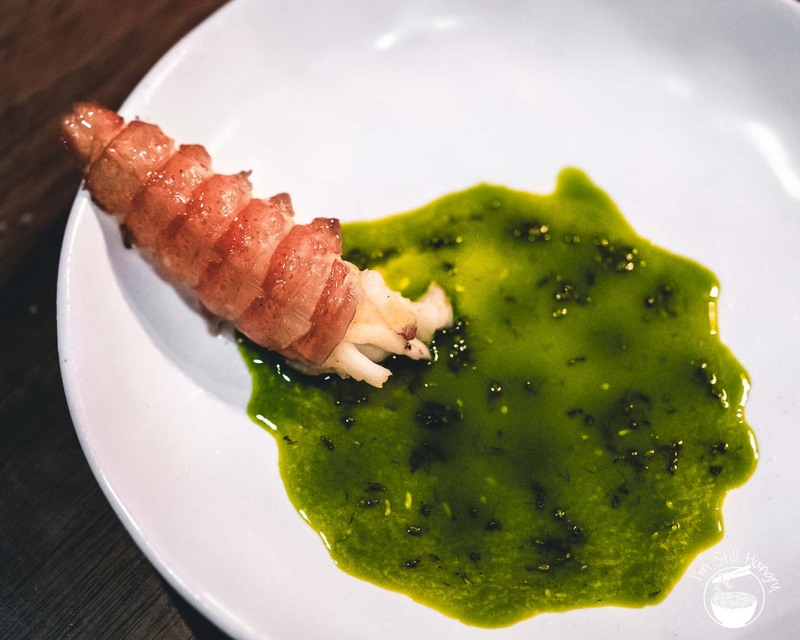 For that is Zonfrillo’s mission: to save the past for the sake of the future, and to perhaps provide a definitive answer to that question: what is Australian food? 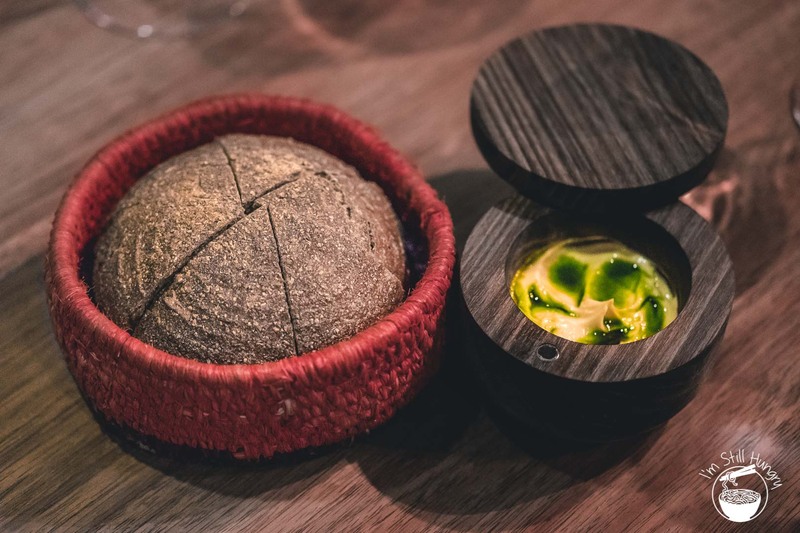 Orana serves a degustation-only menu, appropriately called alkoopina – Aboriginal for ‘snacks’ – which will set you back $240, with optional wine pairings extra. I’m no wine blogger, but I did order the $250 premium wine pairing (when in…Adelaide?) and while I enjoyed it, I suspect those seeking more Australian vino representation would do better opting for the cheaper, $170 pairing. I call it the Bordeaux tax, but to each their own. Probably one of the oldest bread dishes in the world – the style, not this specific dish (though boy, how would that taste…) – is damper, or bush bread. 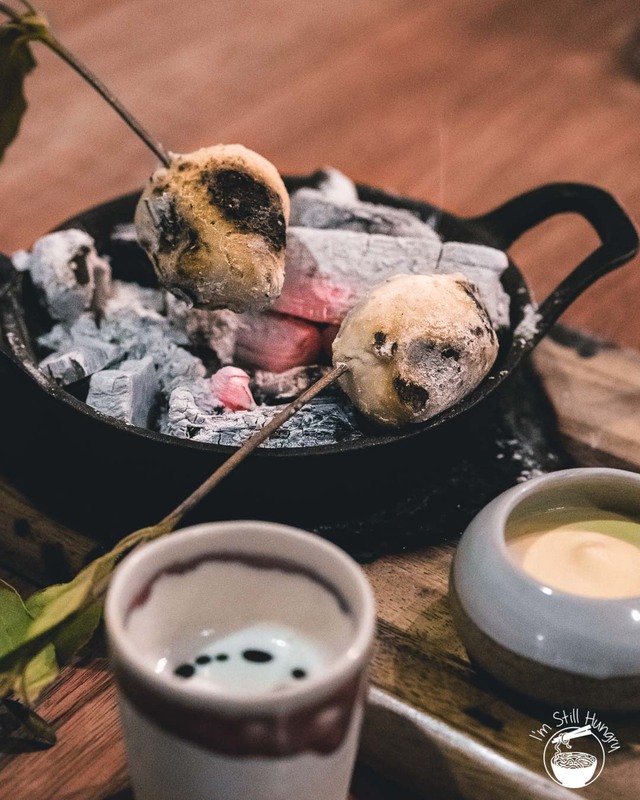 Despite Orana’s intimate, 25-seat dining room hardly seeming the place for it, Zonfrillo insists the dish be served as close as possible to how it would have been made by the indigenous people and bush stockmen: cook your own damn bread on sticks, and over hot – hot – coals. Bush tucker 101. The result? Soft, chewy soda bread with a raw smokiness that was nothing short of impressive – especially for someone who’s grown tired of the classic ‘sourdough and some variant of house-whipped butter’ combo. Paired with a roast lamb butter (smoky, creamy and meaty) and macadamia & lemon thyme (a light, aromatic & raw macadamia flavour) and it became a next level experience. Actually – it’s an Australian experience. With a country girt by sea, our seafood is as good as any’s (ok Japan, you’re a freakish exception). A simple showcase of this were two Coffin Bay oysters, representing South Australia. 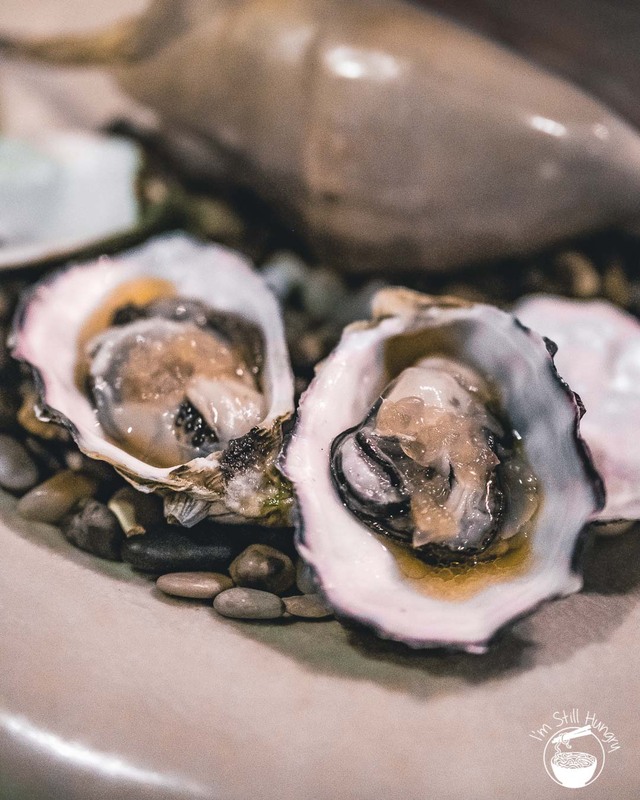 I don’t quite like the oysters from this area, but Orana’s treatment made a point of difference by smoking them, and paired with a blood lime emulsion that was equal parts sweet, equal parts wild, turned the tables. Jumping over the border into Victoria and Australia’s longest river, Murray River cod comes dressed up with eucalyptus butter and an array of raw & semi-cooked vegetables. It’s as much about the texture as the flavour, though the warm-cold nature of the dish also resulted in a warm-cold assessment. 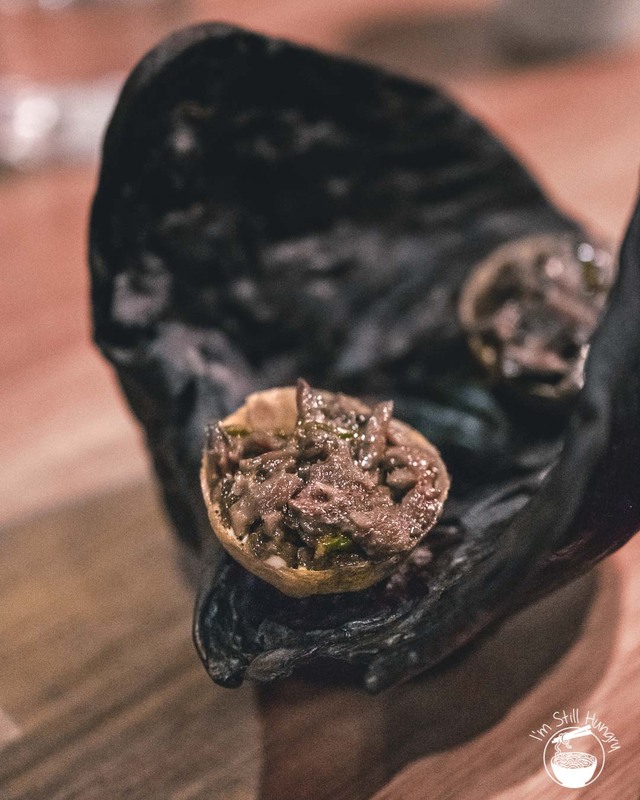 The snacks turn bite-sized, with a protein that is perhaps almost pedestrian at Orana – kangaroo tail. Served in a tart w/potato & mountain pepper, this was a fairly full-on flavour blast in a tight, neat package. The apple toast w/Davidson plum & lardo was…complicated. There’s cold, crunchy and acidic Granny Smith (an Australian invention! ), umami from konbu, a sour-astringency from Davidson plum (considered ‘gourmet bush tucker fruit’) and then mouth-coating lardo. I don’t love it, but that it didn’t not work turned out to be a compliment in its own right. Definitely not your usual deep-fried-palate-pleaser amusé. …I’m pretty blown by this – a combination that doesn’t exist anywhere else, but worked beautifully. Easily one of my favourite dishes and something that is truly Orana’s own. Not far from Coffin Bay is Port Lincoln, a prime region for sustainably-farmed squid. 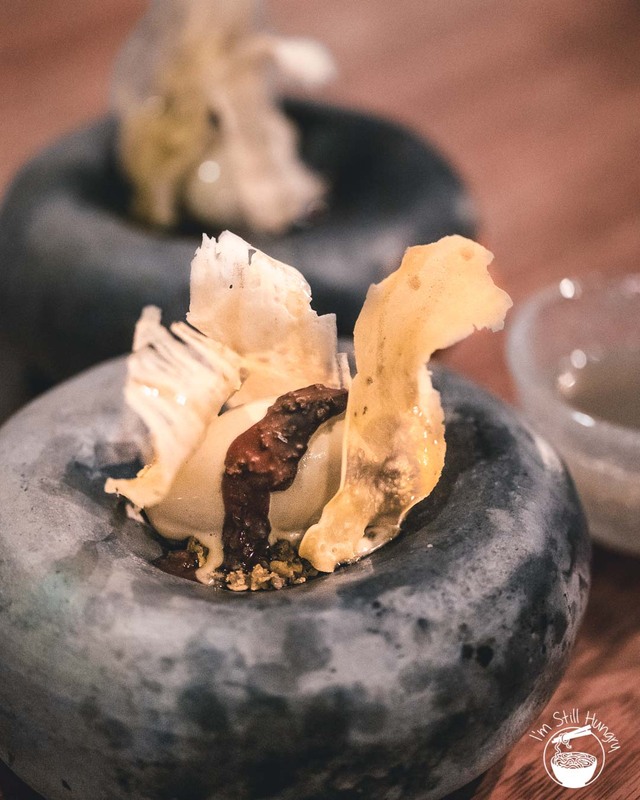 At Orana, it’s hot-coaled, smoked and served with aged beef fat (oh hell yes), sunrise lime and sea blight beach succulents. 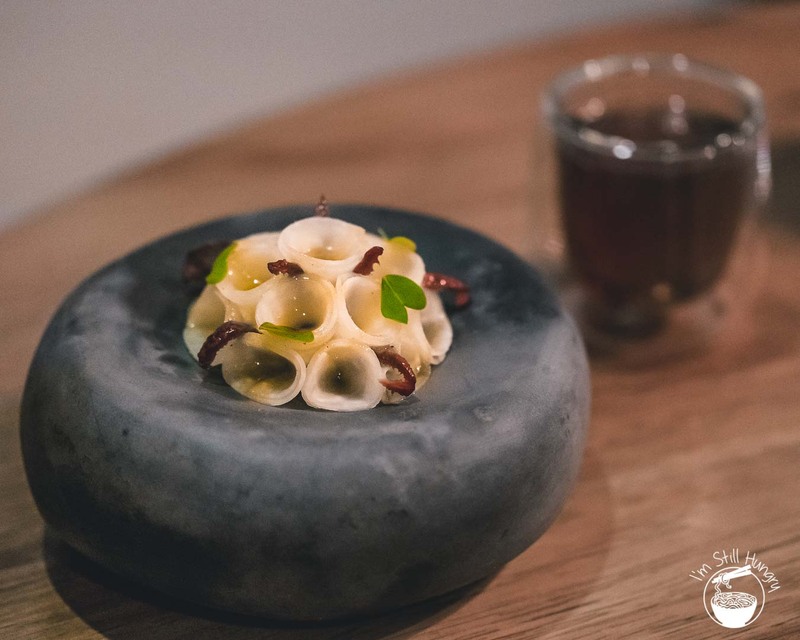 This was a complex dish, with every listed ingredient making its presence known – especially the smoky beef fat – with the squid being the perfect neutral vehicle to carry it all. It was never too heavy either – the lime and zesty succulents made sure of that. It was, however, just a tad too salty. Here’s something cool about sunrise lime I have to share: it’s a native hybrid of the finger lime (itself a native Australian fruit) – and a calamondin. *Takes a breath*, and then, a calamondin is a hybrid of a mandarin and kumquat! 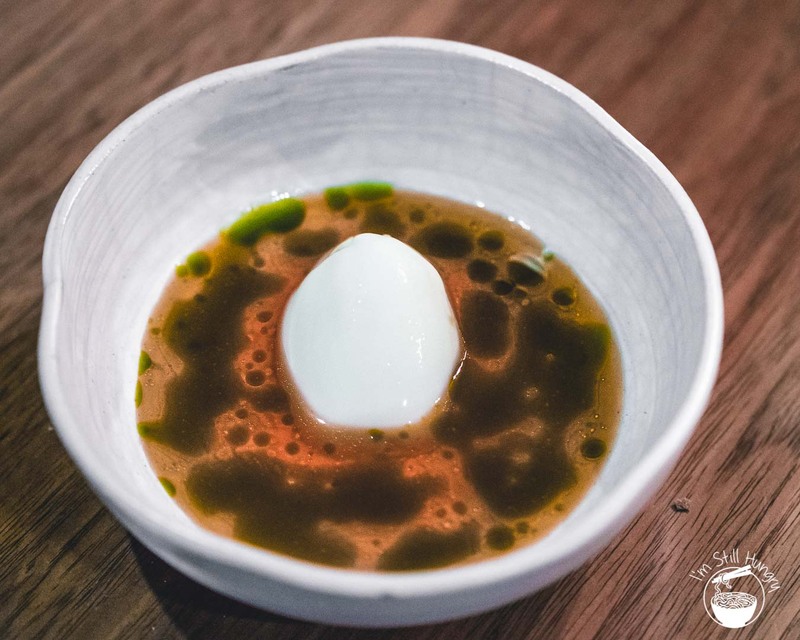 According to Zonfrillo, he once heard an Aboriginal describe a soup Zonfrillo made as ‘soup soup’, and so the name stuck *insert nonchalant shrug emoji*. 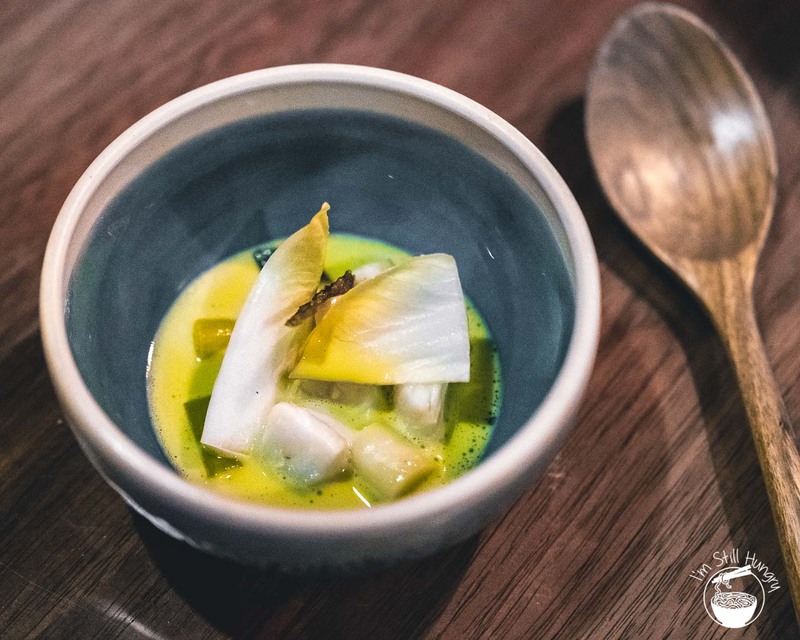 The current menu features a soup soup of marron (another quintessentially, albeit more well-known Australian ingredient) with a multitude of Australian botanicals (the leaves in the picture are eucalyptus). This tasted incredible: think Vietnamese pho soup, but with a stronger seafood bias, and tinged with gingery spices that danced on the tongue. We made it clear to the server of our regret in not BYOing rice noodles. Instead of noodles (*cry*), the soup soup was paired with a salad-esque sculpture crafted out of kohlrabi. The presentation is evocative of a native pine cone, though thankfully it didn’t taste it. Kohlrabi is in many ways like daikon – neutral, crunchy & watery; here, it’s cured to a high piquancy, seasoned with a woody, cinnamon-like dorrigo pepper from the NSW tablelands and garnished w/sour quandongs and lemon myrtle. It was more savoury than I expected, with the quandongs being particularly meaty on the palate. With the palate reset brought about by the kohlrabi, getting a second bread course was almost like starting a new meal again. But who doesn’t like a second serve of bread? Especially when it’s sourdough made with a starter that’s just about old enough to graduate university! It’s completely different to the damper, but that’s to be expected. 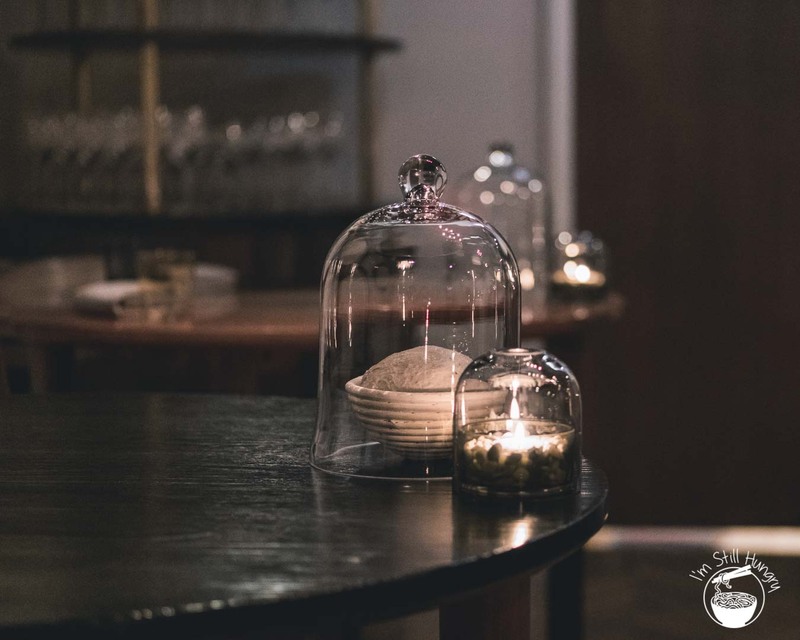 Good sourdough is good sourdough, after all, and Orana’s is full of flavour. The macadamia butter? Hint: tastes like the label. Nowhere near enough. Pro-tip: the staff were more than willing to oblige with a second set – of either butter or bread. You just have to ask! 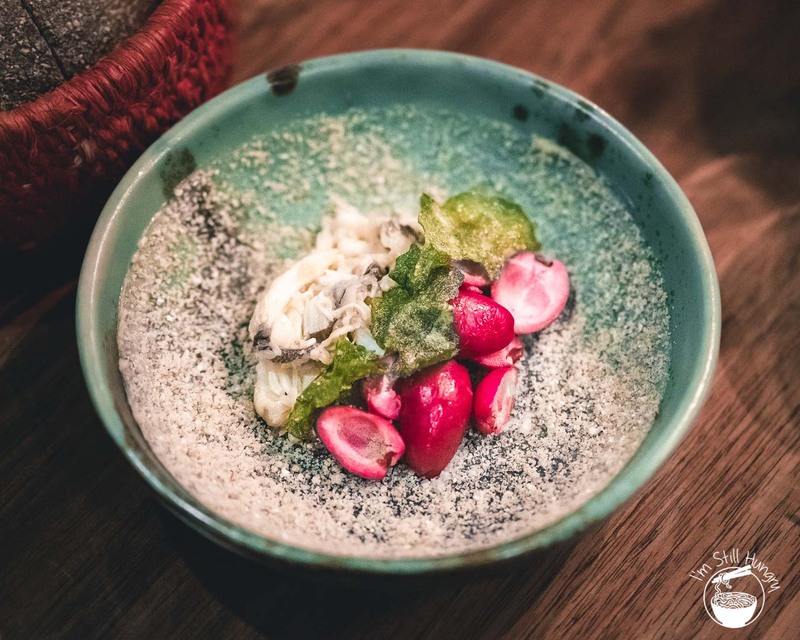 In one of the more interesting dishes of the night, sweet mud crab is served in bowl coated with shredded bunya nuts, evoking the salt flats of Lake Amadeus in the Northern Territory. Bunya nuts, for the record, taste a lot like chestnuts: subtly sweet, nutty and quite starchy when cooked. As if to reinforce Australia’s aridness, brush cherries (another new ingredient!) added tons of crunch whilst being almost completely devoid of water. Deep-fried saltbush is the last splash on the canvas, one that can only be painted here, down under. You may have wondered – as I did – with that delicious marron soup soup, surely you’d get the actual marron at some point? What I didn’t expect was to use it as a literal brush to mop up a sauce of green ants & Geraldton Wax. The former, an insect we’ve only begun to regard as something edible (ick factor still present, but thanks Rene for getting us there); the latter, a flower that spent its time adorning corsages before shifting our attention to its citrusy leaves – that’s the green, see. It was a bright, acidic and even slightly tannic dish. The marron – dare I say it – was almost pedestrian despite being well-poached; merely the vehicle for the invigorating sauce, which was the true highlight. …it’s time to move onto desserts, because this won’t be topped. Jilungin is a native plant whose leaves are used by indigenous Australians to make a tea that purportedly promotes relaxation and aids digestion. 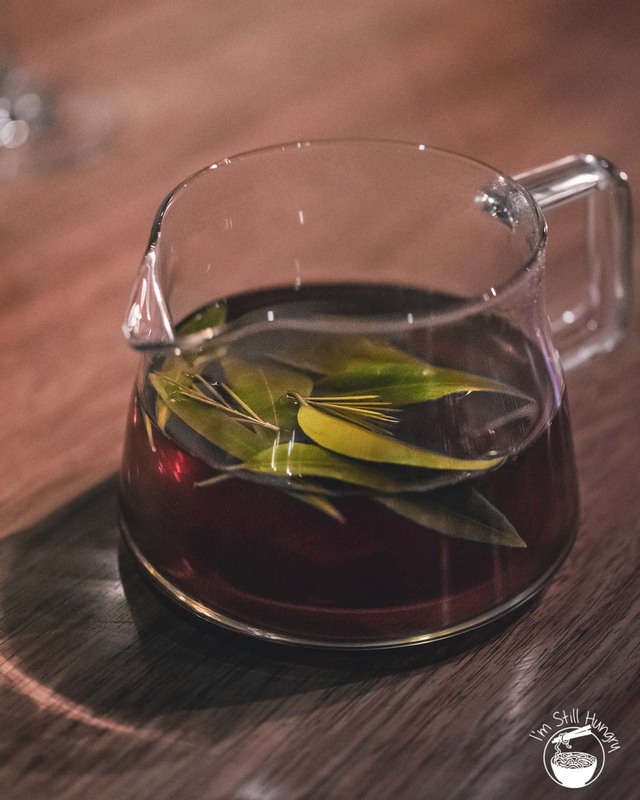 At Orana, this savoury, tannic brew (unfortunately not pictured) was paired with a macadamia sorbet, native honey and macadamia milk paperbark. A standard dessert, relatively speaking – take away the tea and I can recommend five places to get a good macadamia ice cream. Still, good. As if I had subtly signalled for a more interesting dessert, one made its way to our table – without the use of green ants, no less. 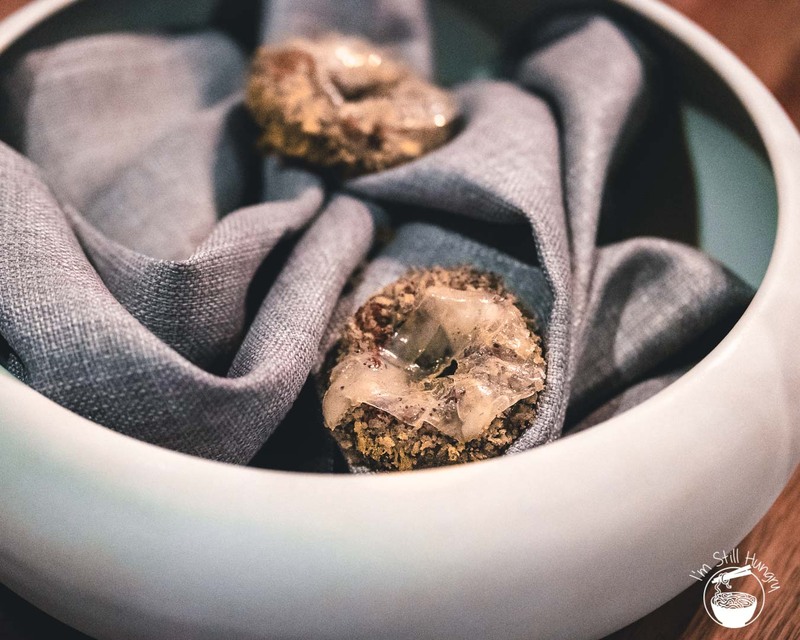 In fact, the set buffalo milk (also called a panna cotta), with wild strawberry juice and eucalyptus oil is one of the few (or only) dishes that has been on Orana’s menu since day 1. It was a complex medley of the soft, the creamy, the funky and the acrid – and yet, delicately sweet and absolutely refreshing. With the world becoming ever-more interconnected, it’s hard to say these days whether a movement can be attributed to individuals, or even single institutions. 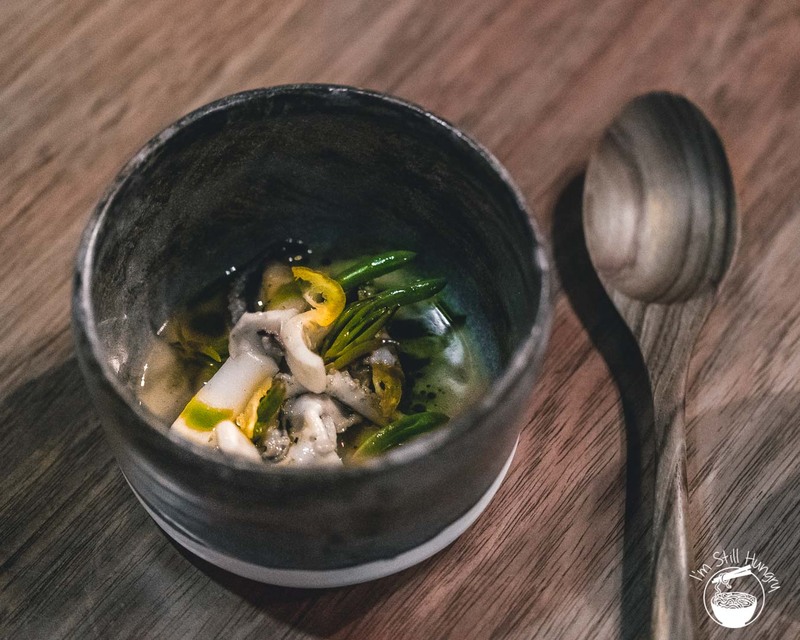 Romantically, I’d like to think restaurants like Orana and Attica – two exceptions that ‘prove the rule’ so to speak – are forging a path for Australian chefs to follow. Indeed, in 2018, it is actually rare to visit a restaurant that doesn’t incorporate an element of native Australia: finger lime is now > $40/kg and is exported internationally as ‘nature’s caviar’, saltbush is now a pantry staple as it is a viable alternative to potato chips, and I see eucalyptus everywhere. Everywhere. There is so much more to say here. I haven’t even gotten into the Orana Foundation, which aims to preserve the culinary history of Australia’s past and integrate it into its future through meticulous cataloguing – Darwin style – of as many native species as possible and reintroducing them into the Australian food zeitgeist. 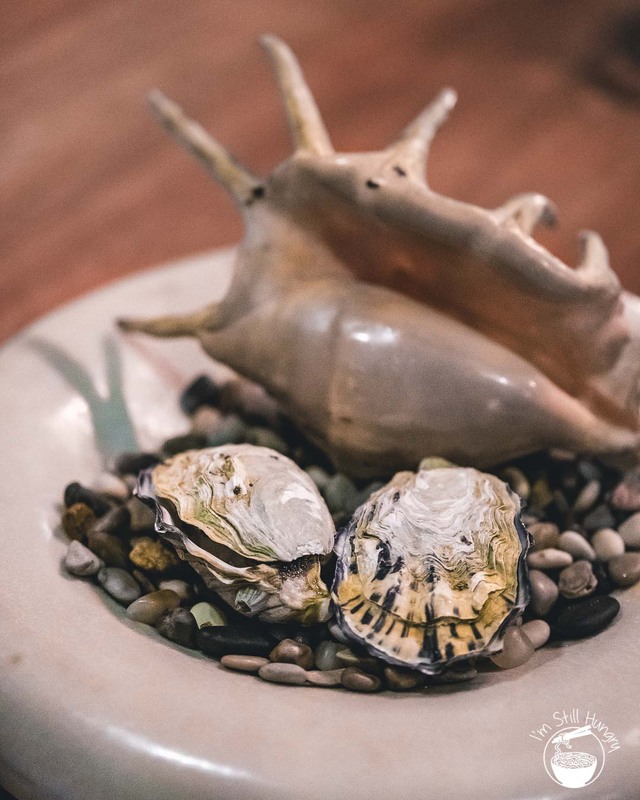 Zonfrillo’s mission is multifaceted, layering his desire indigenous Australian representation, preserving history & culture, promoting sustainability and doing so through some serious persuasion in the form of excellent food. And of course, it’s about answering that question. 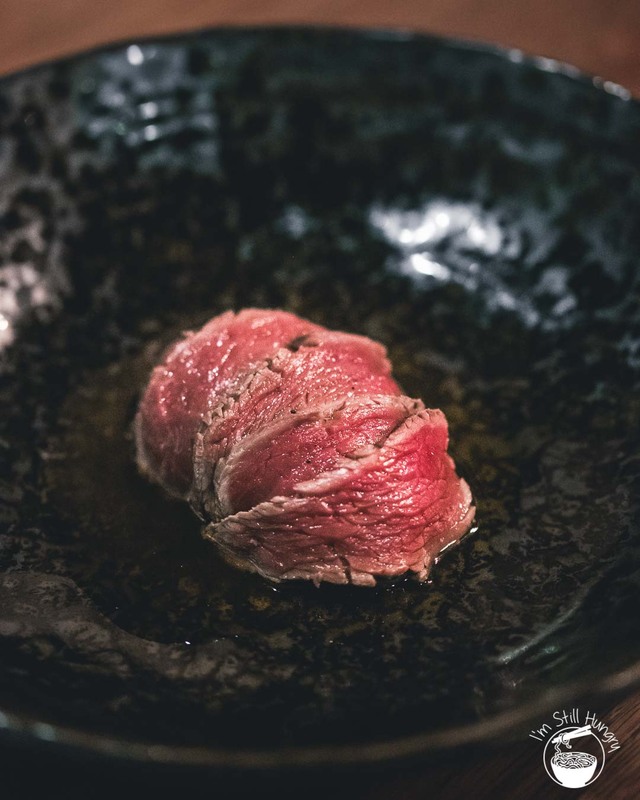 At Orana, I ate my way towards a large part of what is perhaps the answer. By the way, Orana means welcome in the Aboriginal language.